Concept offer a flat roof replacement service which is ideal for new roof or refurbishments. A great choice for an extension roof that is attractive, weather resistant and practical. Extremely low maintenance, a flat roof gives you the reliable service that has an impressive life expectancy of over 40 years. High quality flat roofing is a fantastic way to add value, longevity and reliability to your home. All of our flat roofing is installed by Trained Registered Installers, who have great extensive knowledge and experience in fitting the Sarnafil system. All Sarnafil flat roofs are constructed using premier quality materials, and come completely covered by a 15-year guarantee. All Sarnafil roofs have been independently assessed by the British Board of Agrément, and are expected to last in excess of 40 years. A Sarnafil flat roof will prove itself to be a high quality, and worthwhile investment for any home. All Sarnafil flat roofs are fitted by registered installers, who have passed a rigorous training programme at Sarnafil’s training and assessment centre. Their performance thereafter is regularly monitored and evaluated through a spot check system. 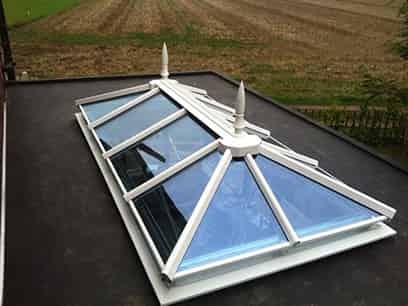 All registered installers are experts in fitting our roofing systems, which ensures that the highest quality of installation is achieved. This ensures product life, and the Sarnafil promise. Our experience has shown that a flat roof can completely define the look of your home. This is why we are happy to offer a wide range of colours, profiles and matching edge trims. 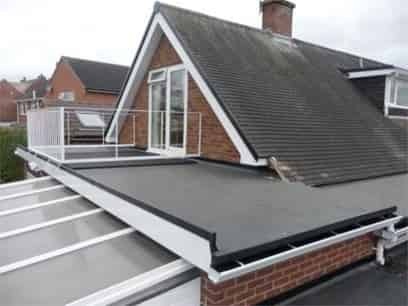 Our flat roofs can be tailored to any property, whether they be modern, ultra-modern or traditional. This allows flat roofs to be exceptionally versatile and adaptable, whilst still maintaining an attractive aesthetic. We’re confident that you’ll find the right flat roof to meet your tastes and preferences. A Sarnafil flat roof combines a long-term guarantee, outstanding life expectancy and low maintenance to provide a cost-effective roofing system, that will ensure significant savings over its lifespan. Interested in our flat roof services? Don’t hesitate to get in touch with us today via our online enquiry form, for a quick and prompt response. Alternatively, you can call us on 0800 289 299, where you will be able to speak to a member of friendly, and helpful team.